Grilling Strip Loin Roast (Top Loin), How To Grill To Perfection. Cut from the short loin, the strip loin is the larger of two meats that make up the T-bone, the smaller tenderloin makes up the other side of the T-bone. 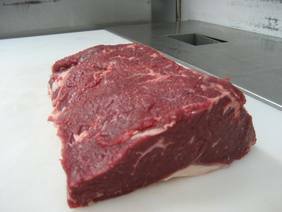 The strip loin steak or New York strip steaks are very a popular cut but not a lot of people use strip loin for grilled roast beef. Strip loin roast is a tender cut with a nice beefy flavor and texture, that when grilled properly this roast beef on the grill is simply a great experience. The secret to acquiring a tender but moist strip loin roast is to sear the roast first at a high temperature and then move it to indirect heat. This will give the strip loin a nice outer crust and seal in the juices. For maximum tenderness and mouth watering flavor grilling strip loin roast to medium-rare is recommended or at the very most grilling to medium doneness, anything more will dry out the meat. Also if you like a little smoky flavor added to your beef than adding wood chunks or wood chips is easy to do on the grill making for a great barbecue beef recipe roast. Click Here To Cook A Strip Loin Roast Indoors. 1. About 60 minutes before grilling strip loin roast remove from the refrigerator, bringing it to room temperature. 5. Leave the main burner on high and turn off all other burners. Place the strip loin over the cool part of the grill fat side up, cook for 1 hour with lid down, and then turn the roast over. As the temperature drops try to keep the temperature about 300 degrees, adjust the heated burner as necessary. Grill the roast approximately 15 minutes per pound but it really depends on the internal temperature of the grill and the size of the roast. Continuing grilling until an instant-read thermometer registers 125-130 degrees for medium-rare which should be another 30-60 minutes? You should always use an instant-read thermometer to check the doneness of a roast. Always remove the roast 10 degrees before the desired temperature, the roast will rise another 10 degrees well resting. When grilling strip loin roast turn the roast work quickly to close cover and retain as much heat as possible in the grill. Cut across the roast and serve. If any of your guest like their roast cook a little more, simply cut off a piece about ¾” and grill another 2 minutes per side over the hot part of the grill. 1. About 60 minutes before cooking the strip loin remove from the refrigerator to bring it to room temperature. 6. Place the strip loin over the cool part of the grill fat side up, cook for 1 hour with lid down, then turn the roast over. Continuing grilling until an instant-read thermometer registers 125-130 degrees for medium-rare which should be another 30-60 minutes? When grilling strip loin roast turn the roast work quickly to close cover and retain as much heat as possible in the grill. Cut across the roast and serve. If any of your guest like their roast cooked a little more simply cut off a piece about ¾” and grill another 2 minutes per side over the hot part of the grill. The internal temperature will rise about 10 degrees during resting time. Remove the strip loin 10 degrees before the desired doneness. Remember when grilling strip loin roast you should always use an instant-read thermometer to check the doneness of a roast. Insert thermometer into thickest part of roast in 2 different spots.